Selected in the second round (15th overall) in the 2016 CFL draft and signed on May 17, 2016. 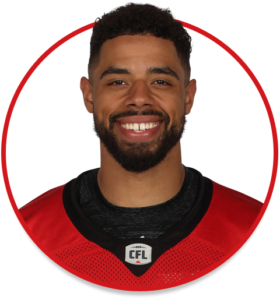 (Calgary) Brescacin dressed for all 18 regular-season contests and established career highs with 35 catches and 567 receiving yards. He scored the first three touchdowns of his CFL career starting with a 12-yard score in a Week 5 game in Ottawa. Brescacin had his first career 100-yard game in Week 14 at Hamilton and a season-high six catches in Week 17 at Montreal. His one-handed leaping catch in the season-opener against Hamilton was rated as the CFL’s play of the year by TSN SportsCentre. Brescacin dressed for both post-season games and had five catches for 35 yards in the Stamps’ Grey Cup victory over Ottawa. (Calgary) Brescacin played 15 games and had 19 catches for 260 yards as well as two special-teams tackles. He was placed on the six-game injured list before Game 5. Brescacin was in uniform for both post-season games and had four catches for 33 yards in the Grey Cup. He changed his jersey number to 82 before the season. (Calgary) Brescacin played seven games and had four catches for 51 yards. He also played in the Western Final and Grey Cup. He spent the rest of the season on the reserve list and the one-game injury list. Brescacin played four seasons (2012-15) at Northern Illinois and had 99 catches for 1,467 yards and 13 touchdowns over his career. He earned the Fran Cahill Award in his final year, given to the Huskies receiver who displays leadership, competitive spirit, hard work and loyalty. In 2014, he shared the team lead in touchdown catches with six and had 31 catches for 445 yards. He had career highs of 33 receptions and 499 yards in 2013. Brescacin set numerous records at Culver Academy in Indiana including most receptions (44), receiving yards (697) and touchdown catches (12) in a season as well as career marks of 70 receptions, 1,314 yards and 19 touchdowns.